Cihan SNG crew narrowly miss injury in Turkey earthquake. A SNG team working for Cihan News Agency had a lucky escape this week when they narrowly missed being crushed by a hotel that collapsed during the earthquake in the town of Van in eastern Turkey. 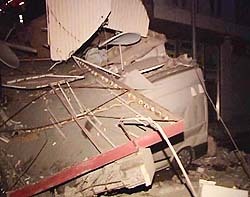 Their SNG vehicle - parked just outside - was destroyed under the weight of falling walls. 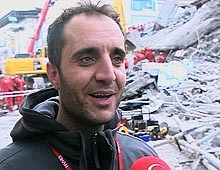 Murat Can from CHA's Operations Department told TVZ that "the crew went out for dinner just one minute before the quake." Two journalists from Dogan News Agency were not so fortunate; at the time of writing they were still missing, believed to be under the rubble of a hotel.